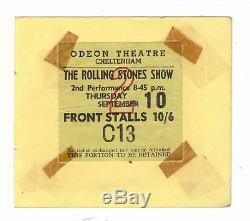 A 2.5" X 2.5" VINTAGE ROLLING STONES CONCERT TICKET STUB FROM 1965. IT HAS BEEN MOUNTED ON A 4.5" X 4" AUTOGRAPH ALBUM PAGE. IT HAS NOW BECOME LOOSE FROM THE MOUNTING. THE GIG WAS AT THE ODEON THEATRE, WINCHCOMBE STREET, CHELTENHAM ON THE 10TH SEPTEMBER 1964. 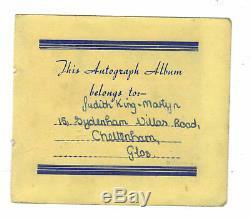 TAKEN FROM AN AUTOGRAPH BOOK OWNED BY JUDITH KING-MARTYN, SYDENHAM VILLAS ROAD, CHELTENHAM. PLEASE SEE MY OTHER ITEMS FROM THE SAME AUTOGRAPH BOOK. DAVE BERRY AND THE CRUISERS PLUS WAYNE FONTANA. KEITH RELF AND JEFF BECK. THE MOODY BLUES - THE ORIGINAL LINE-UP. CHAS CHANDLER FROM THE ANIMALS PLUS THE HOLLIES. THE KINKS PLUS GRAHAM NASH. THE SECOND PHOTO IS FOR REFERENCE ONLY, AS IT IS ON THE REVERSE OF THE DAVE BERRY/WAYNE FONTANA ALBUM PAGE. PLEASE DO NOT HESITATE TO CONTACT ME FOR FURTHER DETAILS AND PHOTOS. The item "ROLLING STONES ORIGINAL CONCERT TICKET STUB FROM 1964" is in sale since Saturday, January 19, 2019. This item is in the category "Collectables\Autographs\Uncertified Originals\Theatre & Stage". The seller is "cambodiajames" and is located in Aberdeen. This item can be shipped to all countries in continental Asia, United States, European Union member countries, Canada, Australia, New Zealand, Norway, Mexico, Switzerland, Chile.